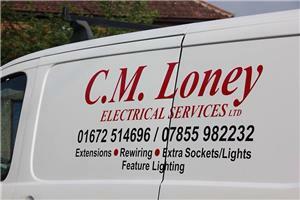 C M Loney Electrical Services Ltd - Electrician based in Marlborough, Wiltshire. Welcome to C M Loney Electrical Services Limited. We are a Marlborough based company which has continued to grow since Chris Loney set it up in 2003. Today we have three electricians, one of whom we successfully mentored through his apprenticeship. We are now supporting our next apprentice through his training. C M Loney Electrical Services Limited has a loyal customer base which has steadily developed as a result of our highly qualified team; our competitive prices and our fast, friendly and reliable service. C M Loney Electrical Services Limited operates within approximately a 30 mile radius of Marlborough and happily undertakes domestic, industrial and commercial work. Whether you need a security light fitted to your house or electrics put into your newly built business premises, we can help you. We are highly skilled and are NICEIC and Part P registered so you can be assured that you are in safe hands. Thank you for taking the time to read about our business. Please contact us for a free, no obligation quote, or to discuss any queries you have. We look forward to hearing from you!